An asteroid family is a population of asteroids that share similar proper orbital elements, such as semimajor axis, eccentricity, and orbital inclination. The members of the families are thought to be fragments of past asteroid collisions. An asteroid family is a more specific term than asteroid group whose members, while sharing some broad orbital characteristics, may be otherwise unrelated to each other. 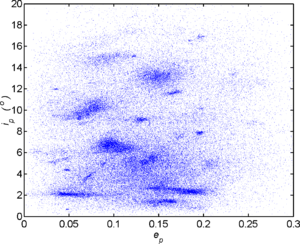 Plot of proper inclination vs. eccentricity for numbered asteroids. Large prominent families contain several hundred recognized asteroids (and many more smaller objects which may be either not-yet-analyzed, or not-yet-discovered). Small, compact families may have only about ten identified members. About 33% to 35% of asteroids in the main belt are family members. There are about 20 to 30 reliably recognized families, with several tens of less certain groupings. Most asteroid families are found in the main asteroid belt, although several family-like groups such as the Pallas family, Hungaria family, and the Phocaea family lie at smaller semi-major axis or larger inclination than the main belt. One family has been identified associated with the dwarf planet Haumea. Some studies have tried to find evidence of collisional families among the trojan asteroids, but at present the evidence is inconclusive. The families are thought to form as a result of collisions between asteroids. In many or most cases the parent body was shattered, but there are also several families which resulted from a large cratering event which did not disrupt the parent body (e.g. the Vesta, Pallas, Hygiea, and Massalia families). Such cratering families typically consist of a single large body and a swarm of asteroids that are much smaller. Some families (e.g. the Flora family) have complex internal structures which are not satisfactorily explained at the moment, but may be due to several collisions in the same region at different times. Due to the method of origin, all the members have closely matching compositions for most families. Notable exceptions are those families (such as the Vesta family) which formed from a large differentiated parent body. Asteroid families are thought to have lifetimes of the order of a billion years, depending on various factors (e.g. smaller asteroids are lost faster). This is significantly shorter than the Solar System's age, so few if any are relics of the early Solar System. Decay of families occurs both because of slow dissipation of the orbits due to perturbations from Jupiter or other large bodies, and because of collisions between asteroids which grind them down to small bodies. Such small asteroids then become subject to perturbations such as the Yarkovsky effect that can push them towards orbital resonances with Jupiter over time. Once there, they are relatively rapidly ejected from the asteroid belt. Tentative age estimates have been obtained for some families, ranging from hundreds of millions of years to less than several million years as for the compact Karin family. Old families are thought to contain few small members, and this is the basis of the age determinations. It is supposed that many very old families have lost all the smaller and medium-sized members, leaving only a few of the largest intact. A suggested example of such old family remains are the 9 Metis and 113 Amalthea pair. Further evidence for a large number of past families (now dispersed) comes from analysis of chemical ratios in iron meteorites. These show that there must have once been at least 50 to 100 parent bodies large enough to be differentiated, that have since been shattered to expose their cores and produce the actual meteorites (Kelley & Gaffey 2000). "Interloper (asteroid)" redirects here. For other meanings of Interloper, see Interloper. When the orbital elements of main belt asteroids are plotted (typically inclination vs. eccentricity, or vs. semi-major axis), a number of distinct concentrations are seen against the rather uniform distribution of non-family background asteroids. These concentrations are the asteroid families. Interlopers are asteroids classified as family members based on their so-called proper orbital elements but having spectroscopic properties distinct from the bulk of the family, suggesting that they, contrary to the true family members, did not originate from the same parent body that once fragmented upon a collisional impact. Comparison: osculating Keplerian orbital elements on the left (families indistinguishable) vs. proper elements on the right (families visible). Strictly speaking, families and their membership are identified by analysing the proper orbital elements rather than the current osculating orbital elements, which regularly fluctuate on timescales of tens of thousands of years. The proper elements are related constants of motion that remain almost constant for times of at least tens of millions of years, and perhaps longer. The Japanese astronomer Kiyotsugu Hirayama (1874–1943) pioneered the estimation of proper elements for asteroids, and first identified several of the most prominent families in 1918. In his honor, asteroid families are sometimes called Hirayama families. This particularly applies to the five prominent groupings discovered by him. Present day computer-assisted searches have identified more than a hundred asteroid families. The most prominent algorithms have been the hierarchical clustering method (HCM), which looks for groupings with small nearest-neighbour distances in orbital element space, and wavelet analysis, which builds a density-of-asteroids map in orbital element space, and looks for density peaks. The boundaries of the families are somewhat vague because at the edges they blend into the background density of asteroids in the main belt. For this reason the number of members even among discovered asteroids is usually only known approximately, and membership is uncertain for asteroids near the edges. Additionally, some interlopers from the heterogeneous background asteroid population are expected even in the central regions of a family. Since the true family members caused by the collision are expected to have similar compositions, most such interlopers can in principle be recognised by spectral properties which do not match those of the bulk of family members. A prominent example is 1 Ceres, the largest asteroid, which is an interloper in the family once named after it (the Ceres family, now the Gefion family). Spectral characteristics can also be used to determine the membership (or otherwise) of asteroids in the outer regions of a family, as has been used e.g. for the Vesta family, whose members have an unusual composition. As previously mentioned, families caused by an impact that did not disrupt the parent body but only ejected fragments are called cratering families. Other terminology has been used to distinguish various types of groups which are less distinct or less statistically certain from the most prominent "nominal families" (or clusters). The term cluster is also used to describe a small asteroid family, such as the Karin cluster. Clumps are groupings which have relatively few members but are clearly distinct from the background (e.g. the Juno clump). Clans are groupings which merge very gradually into the background density and/or have a complex internal structure making it difficult to decide whether they are one complex group or several unrelated overlapping groups (e.g. the Flora family has been called a clan). Tribes are groups that are less certain to be statistically significant against the background either because of small density or large uncertainty in the orbital parameters of the members. Among the many asteroid family, the Eos, Eunomia, Flora, Hungaria, Hygiea, Koronis, Nysa, Themis and Vesta family are the most prominent ones in the asteroid belt. For a complete list, see § All families. The Flora family (adj. Florian; 13,786 members, named after 8 Flora) is the 3rd-largest family. Broad in extent, it has no clear boundary and gradually fades into the surrounding background population. Several distinct groupings within the family, possibly created by later, secondary collisions. It has also been described as an asteroid clan. The Nysa family (adj.Nysian; 19,073 members, named after 44 Nysa). Alternatively named Hertha family after 135 Hertha. 001 Hilda family HIL 409 rim C 0.04 153 Hilda; adj. Hildian; within the larger dynamical group with the same name. 003 Hungaria family H 2965 rim E 0.35 434 Hungaria; located within the dynamical group of the same name. Aemilia family 159 Aemilia — MBA-family (AstDys) according to Milani and Knežević (2014). Total of 62 members. Amneris family 871 Amneris cat Small family of 22 asteroids identified by Zappalà (1995). Most members have been assigned to the encompassing complex of the Flora family by Nesvorný (2014). Anius family 8060 Anius — MBA-family (AstDys) according to Milani and Knežević (2014). Total of 31 members. Ashkova family 3460 Ashkova — MBA-family (AstDys) according to Milani and Knežević (2014). Total of 59 members. Augusta family 254 Augusta cat Small family of 23 asteroids identified by Zappalà (1995). Most members have been assigned to the Flora family by Nesvorný (2014). Ausonia family 63 Ausonia — Single member. Unsourced. Member of the Vesta family according to AstDyS-2 and Nesvorný (2014). Bontekoe family 10654 Bontekoe — MBA-family (AstDys) according to Milani and Knežević (2014). Total of 13 members. Brokoff family 6769 Brokoff — MBA-family (AstDys) according to Milani and Knežević (2014). Total of 58 members. Bower family 1639 Bower — Micro-family with 10 members as per Zappalà (1995). Adj. Bowerian. Alternative name Endymion (Endymionian) family after 342 Endymion. [C] All members: (1639), (3815), (8832), (14306), (15666), (22286), (32637), (85133), (120446) and (145685). This family corresponds in large parts with the König family by Nesvorný (2014). Cindygraber family 7605 Cindygraber — MBA-family (AstDys) according to Milani and Knežević (2014). Total of 19 members. Clematis family 1101 Clematis cat MBA-family (AstDys) according to Milani and Knežević (2014). Total of 17 members. Subset of the large Alauda family as per Nesvorný (2014). All members: (1101), (5360), (22044), (25982), (29963), (32240), (37628), (66174), (71688), (83362), (83790), (97516), (110030), (132961), (147858), (181960) and (223933). Cybele group 65 Cybele cat Cybele group according to Asteroids, Meteorites, and Comets – by Linda T. Elkins-Tanton and projectpluto.com. Corresponding wiki-category lists a total of 32 members. Not a listed family in HCM by Zappalà (1995), Nesvorný (2014) and AstDyS-2 (Src), where these bodies are predominantly assigned to the background population. Dejanira family 157 Dejanira cat Micro-family with 5 members as per Zappalà (1995). All members: (157), (2290), (5276), (10779) and (17377). All belong to the background population according to Nesvorný (2014). Devine family 3561 Devine — MBA-family (AstDys) according to Milani and Knežević (2014). Total of 19 members. Duponta family 1338 Duponta — MBA-family (AstDys) according to Milani and Knežević (2014). Total of 133 members. Epeios family 2148 Epeios — Jupiter trojan family according to Roig and Gil-Hutton (2008). Part of the Menelaus clan. Eumelos family 5436 Eumelos — Jupiter trojan family according to Roig and Gil-Hutton (2008). Part of the Menelaus clan. Euryalos family 4007 Euryalos — Jupiter trojan family according to Roig and Gil-Hutton (2008). Part of the Menelaus clan. Griqua group 1362 Griqua cat Griqua group (not a collisional family) described by projectpluto.com. A marginally unstable group of asteroids observed in the 2 :1 resonance with Jupiter. Hanskya family 1118 Hanskya — MBA-family (AstDys) according to Milani and Knežević (2014). Total of 116 members. Helio family 895 Helio — MBA-family (AstDys) according to Milani and Knežević (2014). Total of 50 members. Hestia family 46 Hestia cat Nesvorný moved family (formerly FIN 503) to candidate status, and (46) to background. :19 Also background according to Milani and Knežević (AstDyS-2). Higson family 3025 Higson — MBA-family (AstDys) according to Milani and Knežević (2014). Total of 17 members. Hippasos family 17492 Hippasos — MBA-family (AstDys) according to Milani and Knežević (2014). Total of 7 members. Kalchas family 4138 Kalchas — Jupiter trojan family according to Roig and Gil-Hutton (2008). Part of the Menelaus clan. Laodica family 507 Laodica cat Category with 2 members. 507 Laodica and 635 Vundtia are core members of the Eos family according to AstDyS-2 (507; 635) and background asteroid per Nesvorný (507; 635), respectively. Levin family 2076 Levin — MBA-family (AstDys) according to Milani and Knežević (2014). Total of 1534 members. Liberatrix family 125 Liberatrix cat 3 listed members. 125 Liberatrix is a background asteroid according to AstDyS-2, and a member of the Nemesis family according to Nesvorný. Background asteroid: 301 Bavaria (both AstDyS-2 and Nesvorný). 9923 Ronaldthiel is a core member of the Agnia family at AstDyS-2. Makhaon family 3063 Makhaon — Jupiter trojan family according to Roig and Gil-Hutton (2008). Part of the Menelaus clan. Marsili family 40134 Marsili — MBA-family (AstDys) according to Milani and Knežević (2014). Total of 16 members. Martes family 5026 Martes cat MBA-family (AstDys) according to Milani and Knežević (2014). Total of 481 members. Largest asteroids are members of the Erigone family according to Nesvorný (5026; 9879). Matterania family 883 Matterania — MBA-family (AstDys) according to Milani and Knežević (2014). Total of 169 members. Mecklenburg family 6124 Mecklenburg — MBA-family (AstDys) according to Milani and Knežević (2014). Total of 78 members. Melanthios family 12973 Melanthios — Jupiter trojan family according to Roig and Gil-Hutton (2008). Part of the Menelaus clan. Menelaus family 1647 Menelaus — Jupiter trojan family according Milani (1993). Part of the Menelaus clan according to Roig and Gil-Hutton (2008). Nele family 1547 Nele — MBA-family (AstDys) according to Milani and Knežević (2014). Total of 344 members. Nocturna family 1298 Nocturna — MBA-family (AstDys) according to Milani and Knežević (2014). Total of 186 members. Nohavica family 6539 Nohavica cat Previously known as the "1982 QG" family. Second member: (9935) 1986 CP1; both are background asteroids according to AstDyS-2 and Nesvorný. Podarkes family 13062 Podarkes — Jupiter trojan family according to Roig and Gil-Hutton (2008). Part of the Menelaus clan. Prokne family 194 Prokne — MBA-family (AstDys) according to Milani and Knežević (2014). Total of 379 members. Reginita family 1117 Reginita cat Claimed subgroup of the Flora family. Background asteroid according to both AstDyS-2 and Nesvorný. Sinden family 10369 Sinden — MBA-family (AstDys) according to Milani and Knežević (2014). Total of 24 members. Telamon family 1749 Telamon — Jupiter trojan family according to Roig and Gil-Hutton (2008). Part of the Menelaus clan. Traversa family 5651 Traversa — MBA-family (AstDys) according to Milani and Knežević (2014). Total of 56 members. Univermoscow family 6355 Univermoscow — MBA-family (AstDys) according to Milani and Knežević (2014). Total of 13 members. Zhvanetskij family 5931 Zhvanetskij — MBA-family (AstDys) according to Milani and Knežević (2014). Total of 23 members. C These are families listed as "robustly" identified in Bendjoya and Zappala (2002). D TNOs are not considered asteroids, but are included here for completeness. Candidate families (Nesvorný)::19 929 Algunde, 1296 Andrée, 1646 Rosseland, 1942 Jablunka, 2007 McCuskey, 2409 Chapman, 4689 Donn, 6246 Komurotoru. (13698) 1998 KF35, 539 Pamina, (300163) 2006 VW139, 3567 Alvema, (7744) 1986 QA1 260 Huberta, 928 Hildrun, 2621 Goto, 1113 Katja, 8737 Takehiro, 46 Hestia 5 Astraea, 1044 Teutonia, 3110 Wagman, 4945 Ikenozenni, (7744) 1986 QA1, 8905 Bankakuko, (25315) 1999 AZ8, (28804) 2000 HC81. ^ Michael E. Brown, Kristina M. Barkume, Darin Ragozzine & Emily L. Schaller, A collisional family of icy objects in the Kuiper belt, Nature, 446, (March 2007), pp 294-296. ^ David Nesvorný, Brian L. Enke, William F. Bottke, Daniel D. Durda, Erik Ashaug & Derek C. Richardson Karin cluster formation by asteroid impact, Icarus 183, (2006) pp 296-311. ^ a b c d e f g h i j k l m n o p q r s t u v Nesvorný, D.; Broz, M.; Carruba, V. (December 2014). 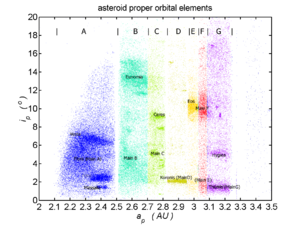 "Identification and Dynamical Properties of Asteroid Families" (PDF). Asteroids IV: 297–321. arXiv:1502.01628. Bibcode:2015aste.book..297N. doi:10.2458/azu_uapress_9780816532131-ch016. Retrieved 23 June 2017. ^ "Small Bodies Data Ferret". Nesvorny HCM Asteroid Families V3.0. Retrieved 22 July 2017. ^ This is a joke by Nesvorný et al. In their Table 2 the reference is to the 1995 film, "GoldenEye". ^ a b c d e f g h i j k l m n o p q r s t u v w x y z aa ab ac Milani, Andrea; Cellino, Alberto; Knezevic, Zoran; Novakovic, Bojan; Spoto, Federica; Paolicchi, Paolo (September 2014). "Asteroid families classification: Exploiting very large datasets" (PDF). Icarus. 239: 46–73. arXiv:1312.7702. Bibcode:2014Icar..239...46M. doi:10.1016/j.icarus.2014.05.039. Retrieved 17 April 2018. ^ a b Carruba, V.; Domingos, R. C.; Nesvorný, D.; Roig, F.; Huaman, M. E.; Souami, D. (August 2013). "A multidomain approach to asteroid families' identification" (PDF). Monthly Notices of the Royal Astronomical Society. 433 (3): 2075–2096. arXiv:1305.4847. Bibcode:2013MNRAS.433.2075C. doi:10.1093/mnras/stt884. Retrieved 5 December 2018. ^ Masiero, Joseph R.; Mainzer, A. K.; Bauer, J. M.; Grav, T.; Nugent, C. R.; Stevenson, R. (June 2013). "Asteroid Family Identification Using the Hierarchical Clustering Method and WISE/NEOWISE Physical Properties" (PDF). The Astrophysical Journal. 770 (1): 22. arXiv:1305.1607. Bibcode:2013ApJ...770....7M. doi:10.1088/0004-637X/770/1/7. Retrieved 25 April 2018. ^ a b c d e f g h i j k l m n o p q r s t u v w x y z aa ab Knezevic, Zoran; Milani, Andrea; Cellino, Alberto; Novakovic, Bojan; Spoto, Federica; Paolicchi, Paolo (July 2014). "Automated Classification of Asteroids into Families at Work". Complex Planetary Systems. 310: 130–133. Bibcode:2014IAUS..310..130K. doi:10.1017/S1743921314008035. Retrieved 17 April 2018. ^ a b c d e f g V. Zappala (1995). "Asteroid Dynamical Families – EAR-A-5-DDR-FAMILY-V4.1". NASA Planetary Data System. Retrieved 7 November 2018. ^ a b c d e f g h i Roig, F.; Ribeiro, A. O.; Gil-Hutton, R. (June 2008). "Taxonomy of asteroid families among the Jupiter Trojans: comparison between spectroscopic data and the Sloan Digital Sky Survey colors" (PDF). Astronomy and Astrophysics. 483 (3): 911–931. arXiv:0712.0046. Bibcode:2008A&A...483..911R. doi:10.1051/0004-6361:20079177. Retrieved 29 June 2018. ^ Milani, Andrea (October 1993). "The Trojan asteroid belt: Proper elements, stability, chaos and families". Celestial Mechanics and Dynamical Astronomy. 57: 59–94. Bibcode:1993CeMDA..57...59M. doi:10.1007/BF00692462. ISSN 0923-2958. Retrieved 29 June 2018. Nesvorný, David; Bottke Jr., William F.; Dones, Luke; and Levison, Harold F.; "The recent breakup of an asteroid in the main-belt region", Nature, Vol. 417, pp. 720-722 (June 2002). M. S. Kelley & M. J. Gaffey 9 Metis and 113 Amalthea: A Genetic Asteroid Pair, Icarus Vol. 144, p. 27 (2000). Planetary Data System - Asteroid Families dataset, as per the Zappalà 1995 analysis. Latest calculations of proper elements for numbered minor planets at astDys. Asteroid (and Comet) Groups by Petr Scheirich (with excellent plots).